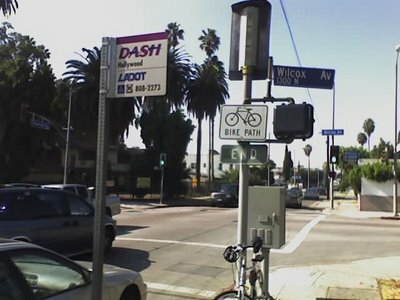 HOLLYWOOD, CA – On Fountain Avenue, right in front of the Hollywood Field Office for the City of Los Angeles, sits the World’s shortest bike path. It has no beginning, it only has an end. It literally exists only at the point at which it ceases to exist. As SoapBoxLA prepares to pick up the phone and call the LADOT Bikeways Department the words of a well-meaning but so-far-off-base leader of a local cycling advocacy group come to mind. How sad! To think that some cyclists might tolerate Transportation Malpractice because they think bad service is better than none at all. Whoof! With a shake of the head SoapBoxLA picks up the phone…(this is a group activity, pick up your phone) dials 323-845-9835 and tells Jeannie L. Shen of the Hollywood-Wilshire District of the LADOT that we can’t find the beginning of the Fountain Bike Path. Thank Jeannie for her good, hard work and invite her to go on a ride. That Jeannie Shen is useless. She's an engineer - likely she does not know what the sidewalk feels to walk on.